The peeled, pre-sized and inspected potatoes are transported /dosed onto the segmenting machine in 4 lanes (singulined) with a dosing singulator. 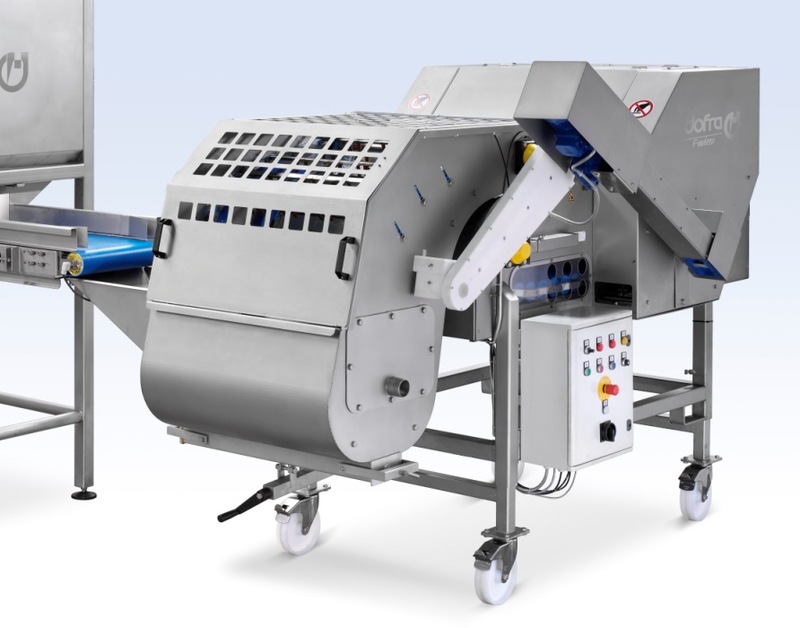 The dosing singulator can be set at different angles to the segmenter to adapt to the singulation of smaller and bigger size potatoes. The singulator is equipped with 4 wipers to be sure of correct singulation of the potatoes. The potatoes drop one by one onto the transporting rollers in 4 rows. The transporting rollers are shaped in such a way that the potatoes are aligned lengthwise. By means of a double finger system each potato is positioned/centered symmetric before cutting. On request it is also possible to apply a combined segmenting knife block section. This way it is possible to cut potatoes in two lanes into 2 pieces and two lanes into 4 pieces, or an other cut. Default the segmenting machine will be delivered with one knife block to cut the potatoes into quarters. By means of one knife block in one stroke, 8 potatoes are cut. The knife block is driven with our Continuous Processing Technology to insure a long life span, a smooth running and a minimum of maintenance.